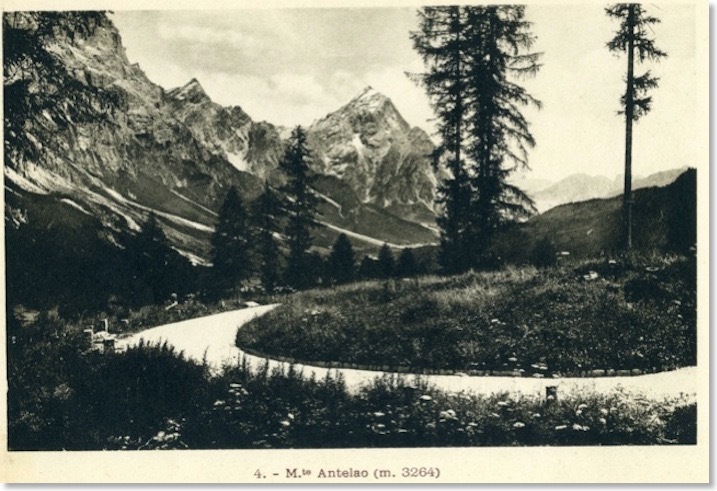 Cristallo is the prominent mountain in the background to these photographs. It is one of the giants of the Dolomites, at 3,221 metres. 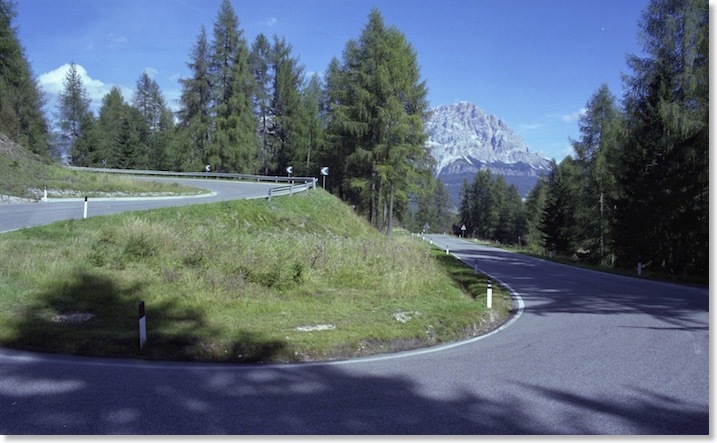 The view of the mountain from this distinctive double bend on the Great Dolomite Road, not far above Cortina has been partly obscured by trees. I chose a modern viewpoint that showed the mountain, despite that being from a very slightly different spot to the one which Zardini used. This same photo is used in both of the Zardini booklets I have. Little else has changed, however. Stone kerb-stones have been replaced by plastic reflector posts and steel railings, and the road has been surfaced. 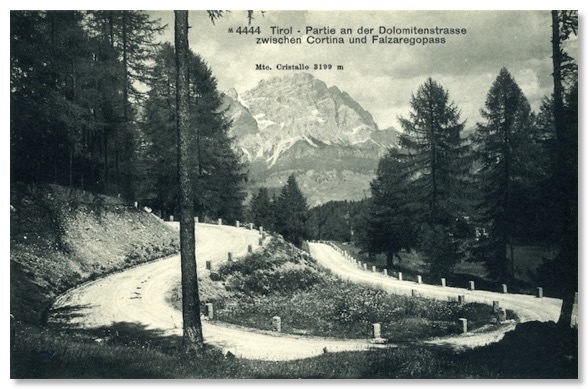 It is easy to forget that the Great Dolomite Road was, for much of its length, a dirt and gravel road until the 1950s, and some pass summits were not paved until later than that. The English photographer W. A. Poucher, writing in his photographic book “The Magic of the Dolomites” (published 1951) tells of “clouds of dust thrown up by tyres, covering the inside of the vehicle and getting into one’s hair and clothes”. Many hairpin bends on the road were cobbled, however, and even in the 1990s, I can recall bends with just cobbled surfaces. Occasionally, the cobbles still reappear when damage to the tarmac surface creates potholes on some tight bends. 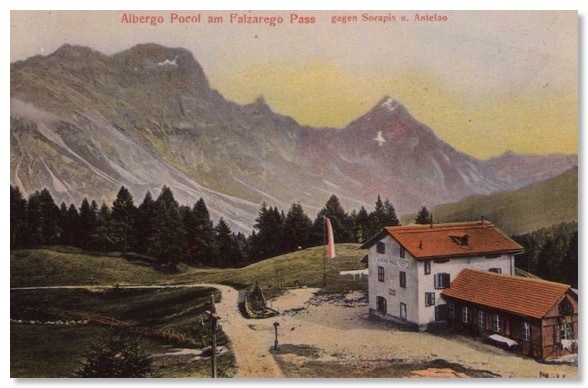 When I found this postcard view, by “Photoglob” of Zurich, I began to realise how competitive the postcard market of the 1920s must have been. I think it has to be an even older photo than the others. I wonder which of the photographers cut down the tree to get a clearer view? Aside from the intrusive tree in the foreground, mature yet strangely missing from the views taken by others, it is, of course, the exact same shot. 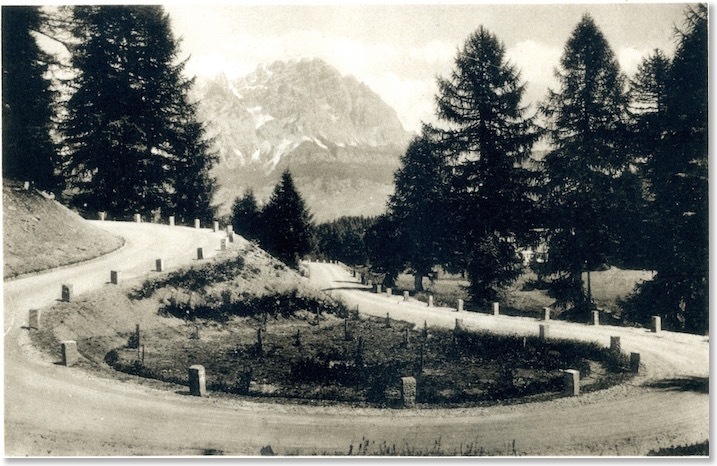 I was also able to find on the internet this photo, which is the same set of bends, and which must date from the mid 1930s, because it shows the tower of the Pocol Ossuary (centre of shot) which only opened in 1935. This tower contains the re-interred bones of nearly 10,000 Italian soldiers from the WW1 fighting in this area. The identity of about half of the bodies in the tower has never been properly determined. 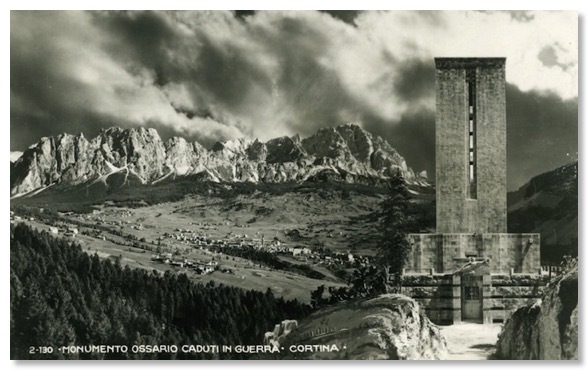 A Florence flea-market yielded this photo, by Ghedina of Cortina, of the Pocol Ossuary, looking over Cortina towards Cristallo. There is no date on it, but it’s late 1930s or early 1950s, probably. 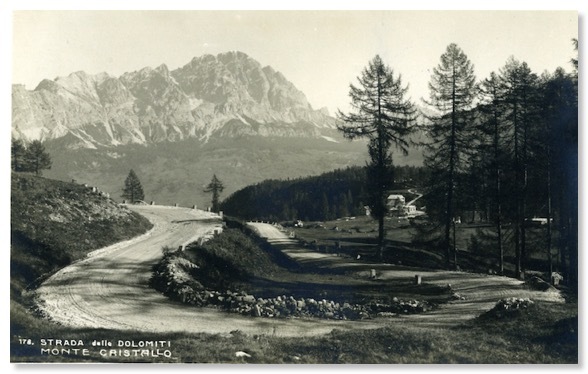 The photo looks generally south eastwards, to the little visited second highest summit of the Dolomites, Antelao, which is only about 50 metres lower than the Marmolada, the area’s highest peak.